I have two questions. The first is about my violin I bought this at a violin shop in San diego when i was stationed there. I bought it because i was going to be living in the barracks in my next duty station and it was quieter because it didn't produce the same amount of vibrations as a regular violin. 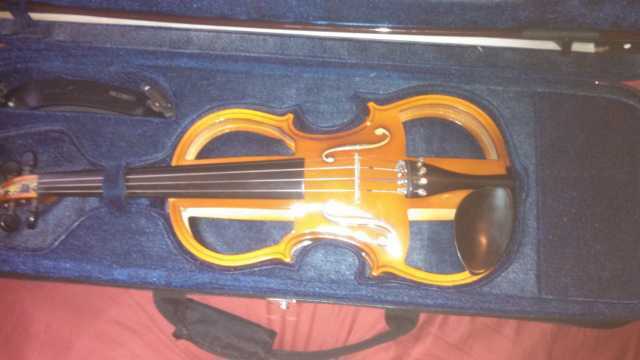 my question now is, i have my own house and don't have to worry about being quiet any longer, does my violin make it harder to learn by ear because the cutouts make it sound slightly different? it is acoustic not electric. My second question. I'm trying to learn the scale on the G string, its going slowly so i learn each note correctly before i move to the next one, but i haven noticed my fingers have a tendency to overlap onto the d string. is there a way to fix this or is it gonna be a combination of careful placement and tons of practice? thanks guys! I cannot answer that question having never heard your violin or one like it. I don't imagine it would make it more difficult at all since electrics don't sound like acoustics and your acoustic probably doesn't sound like other acoustic violins. An A is an A and a D id a D.
As for finger placement. It will come in time. Your fingers will remember where to go to get that crisp sound you want. So practice practice practice but most of all have fun with it. One suggestion. Since you can now rock out on your violin, why not add an electric pickup to it. I was thinking the exact same thing that Kevin said about adding a pickup. Don't worry about your fingers overlapping the D. That is normal and OK most of the time. Later when you need to play double-stops (two notes together) you can have your fingers more to the opposite side depending on which two notes you are playing. Lot's of times you use the same finger on two strings as the interval is a perfect fifth which is very popular with many chords/double-stops. thanks so much fiddlerman! good to know about the double stops! and I'm defiantly gonna have to look into that pickup! so many exciting days ahead on this new adventure!